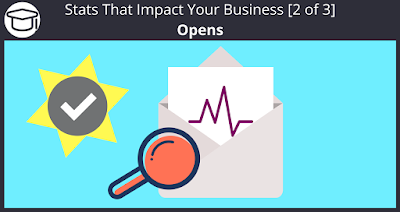 Arguably, opens are the most important metric for your email marketing campaigns. If your subscribers aren’t opening your emails then they are not clicking on the links and buying the products that you promote. It all starts with the open. In sales, it’s all about the close but in email marketing it’s all about the open. It’s always a good idea to shoot for a 10% open rate at the least. I have definitely seen higher open rates but it usually will depend on the relationship you have with your list. If you build a trusted relationship with your list you will see higher open rates. The Subject Line of your email will impact your open percentage. Long and unappealing subject lines will cause a massive drop in your open rates. Subject lines that are spammy will cause a double whammy by not getting an open, and getting a spam complaint. (and I don’t mean when a Hawaiian is angry about the lack of meat on his plate) Clear, concise, and short subject lines have had a history of increasing your open rates. You want to peak their curiosity with your subject line. Timing is everything or nothing? Many Digital Marketers will argue that the timing of sending emails will also affect your open rates. The specific days of the week will also make difference when to send your emails. The right time and day to send will depend on your list. This why it’s important to monitor your stats and to see what days and what times seem to accumulate the most opens. To save time, you can just use Sendlane’s Optimized Timing feature that will track when each of your subscribers tends to open their emails, and then sends them emails at those times. It takes all the headache out of making sure that you are sending to your subscribers at the right days, times, and timezones. One other piece of information you want to consider is: the first few lines of the actual email you are sending. Most email providers give a one to two sentence preview of the content of your email, and it’s usually just the first few lines. So class, what should you do with the first few sentences of your email? Anyone? Bueller, Bueller? You should make your first few lines amazing and powerful. It could be sole reason why someone opens your email. Thanks for reading, and we value your comments. Let us know the best subject line you have used. When you share you make the world a better place.